Penetrates deeply to give long lasting protection from damage caused by wet/dry rot, fungi and wood boring insects. Hazard safety codes: R20, R22, R43, R50, R53. 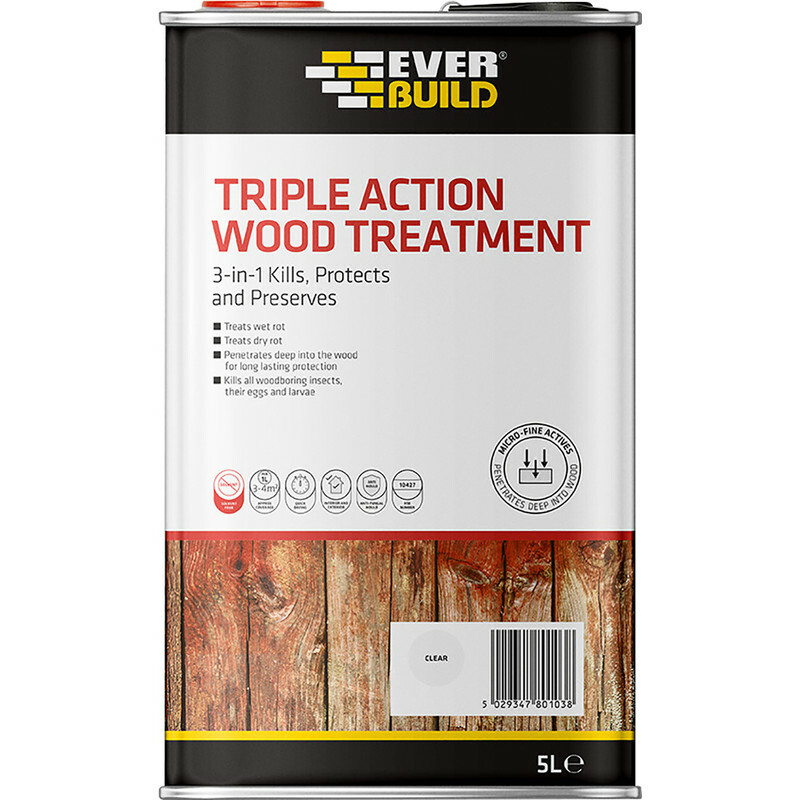 Lumberjack Triple Action Wood Treatment 5L is rated 4.5 out of 5 by 27. Rated 4 out of 5 by Walkingthedinosaur from Good size & seems to work so far Just bought 2 cans of this to treat old decking joists after ripping up the old boards. Some of the joists had white fungus stuff & after painting this on it’s gone brown & seems to be dying off. Also kills off bugs. The joists look better than they did & I’m planning to use this on my outdoor table as well. Next day delivery from toolstation so am a happy customer. Only given 4 stars as haven’t had time to see how well this stuff will work. Rated 5 out of 5 by Jaz32 from good value Happy with purchase ( wish they did two and a half litre tins ) used on timber before painting, needs time to soak in and dry before painting, time ?? will tell if the treatment works. Rated 5 out of 5 by Handymann from Brilliant Bought this preservative a while ago now.Goes along way and only time will tell if it does what it says on the tin. Rated 5 out of 5 by Caroline 1 from The multi- purpose feature also influenced decisio I have used half of this five litre tin but can’t appreciate the benefits just yet ask me in about 5 years. The reviews helped me to make this choice.